There was a time when Assassin’s Creed was one of the premier video game series out there, when players worldwide were eager to play the next instalment of the series and games like Assassin’s Creed II and Assassin’s Creed IV: Black Flag were some of the hottest titles around. Assassin’s Creed could reclaim its place this year as one of the top video game franchises thanks to Assassin’s Creed Origins, the upcoming entry in the series which looks like it could be one of the best Assassin’s Creed games in years when it debuts this October. After all, Ashraf Ismail, the Ubisoft man and creative director behind 2013’s superb Black Flag is behind this project, which could turn out to be one of the biggest and best games in the series when it hits shelves this year. So what new features and improvements does this latest Assassin’s Creed game bring to the table? 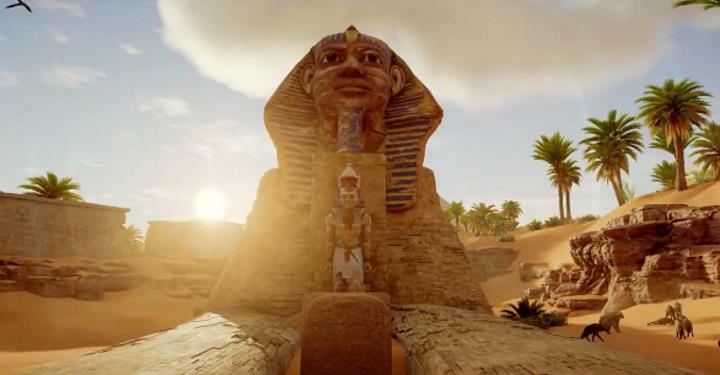 One thing is the game’s setting, as Origins will take place in Ptolemaic Egypt, a location far removed from the American and European settings of its predecessors. Also, aside from featuring cutting-edge graphics as seen in the game’s E3 trailer, the game world will be seamless this time, with creative director Ashraf Ismail telling Eurogamer in an interview that “technologically speaking we wanted to improve from Black Flag so that everything was seamless. Going into Alexandria, it’s seamless, [whether you] go over its walls, go through a hidden cave, go through the main gates, it’s up to you. It was an improvement we needed to make, and I’m really happy Ubisoft saw the value of that”. Also, both the inhabitants of ancient Egypt and the animals will got about their business during the game’s day and night cycle in this Assassin’s Creed game. “So now every NPC and animal in the world has a purpose, a function, a day-night cycle. They need to go to eat, sleep, go to the washroom”, said Ismail. Alexandria is one of the cities you will be able to visit in Assassin’s Creed Origins. Also, Ismail spoke more about the game’s protagonist Bayek. According to Origins’ creative director, Bayek is a “Medjay, someone from a line of highly-trained warriors, but also a kind of sheriff – which helps explain why he undertakes all these quests”. He will be “highly reactive” according to Ismail, with Origins creative director adding that “when things are good, it’s wonderful. When things are bad, he’ll tear down the sky. He has a lot of compassion for the people of Egypt but is wary of outsiders”. He will also be the series’ first Assassin, as this game tells an origin story about how the famous order came to be. This explains why some things players have taken for granted in the earlier games won’t be available off the bat in Origins. One example is the series’ famous “eagle vision” a form of magical vision which highlights enemy characters in red, amongst other things. 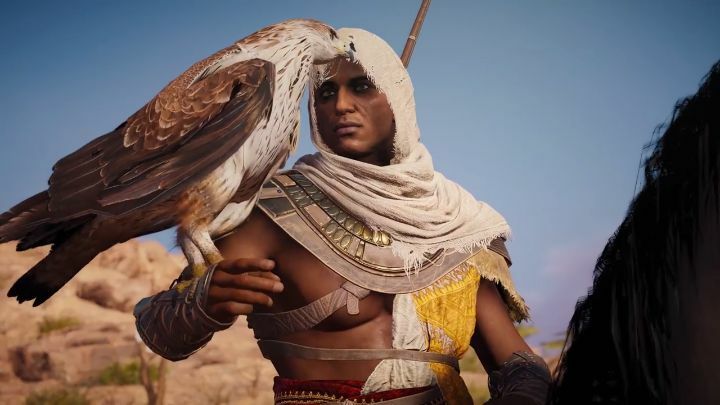 Bayek will instead be able to use his pet eagle to scout ahead and reveal the locations of enemies and important items in the world in this game. Of course, Bayek will be as deadly a hero as earlier Assassin’s Creed protagonists such as Ezio Auditore and Edward Kenway were, and we saw him ruthlessly dispatching his enemies with a bow and other weapons in an impressive gameplay video which Ubisoft released at this year’s E3. Another thing that caught players’ eyes in Assassin’s Creed Origins’ E3 trailer was the appearance of a giant snake towards the end. This led some to believe that the game would include fantastical creatures (like the Gods of Egypt movie) or perhaps that this was some kind of dream sequence… However, Ashraf Ismail refused to clarify this is in the Eurogamer interview, only stating that it would make complete sense to players when they “experience it”. What’s clear, though is that Assassin’s Creed Origins looks like it could end up being the best entry in the series since Assassin’s Creed IV: Black Flag when it ships this fall, and the kind of epic historical experience that made the first Assassin’s Creed games such great time-killers in the past.